"I'm offering you Manhattan champ, don't play hard to get." Screen Media has debuted an official trailer for Ten Thousand Saints, from writers/directors Shari Springer Berman & Robert Pulcini (of American Splendor, The Nanny Diaries, Girl Most Likely), starring Ethan Hawke and Asa Butterfield. Hawke plays an estranged father who suddenly "kidnaps" his emo-punk son and takes him to New York City, where he experiences a whole coming-of-age on the streets of Manhattan with new friends. The film is set in the 80's around the punk rock scene and it seems to have a killer soundtrack, of which many of the reviews quoted rave about. Hailee Steinfeld also stars along with Emile Hirsch and Emily Mortimer. They give away a lot (too much) in this trailer, but it actually looks pretty good. "Have you ever heard of punk?" Adapted from the novel by Eleanor Henderson, Ten Thousand Saints is a coming-of-age story about three teenagers in late 1980s New York City—Jude (Butterfield), new to the city from Vermont, "straight-edge" musician Johnny (Hirsch), and troubled, rich uptown girl Eliza (Steinfeld)—who break away from their messed-up parents (Hawke & Mortimer) to form their own surrogate family. Set in 1988, a time of great cultural upheaval—against the excesses of the decade, the AIDS epidemic and the gentrification of the city culminating in the infamous Tompkins Square Park riots—Ten Thousand Saints is a nostalgia trip to a bygone era of New York City. The film is co-directed by Shari Springer Berman & Robert Pulcini, of American Splendor, The Nanny Diaries and Girl Most Likely previously. It first premiered at the Sundance Film Festival. 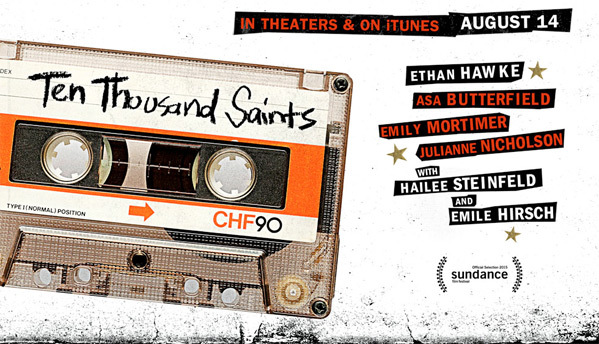 Screen Media will be debuting Ten Thousand Saints in select theaters starting August 14th. Surprisingly, this looks pretty solid. I don't like Butterfield's hair, but everything else seems like solid work. Knowing a few folk from hippy parents, this film actually makes some sense.